Molecular chaperones promote polypeptide folding in cells by protecting newly made and otherwise misfolded proteins against aggregation or degradation by the ubiquitin proteasome pathway. 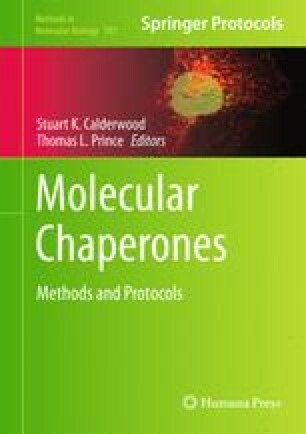 The roles of Saccharomyces cerevisiae Cdc37 and Ydj1 molecular chaperones are described in this chapter. We focus on biogenesis of protein kinases that require several different molecular chaperones for their proper folding. Specific among these is Cdc37, which binds directly to its kinase clients either during or shortly after translation and protects them against rapid proteasomal degradation. Ydj1 has a similar role, but is less specific for protein kinases in its role as a molecular chaperone. The method that we describe uses pulse chase and immunoprecipitation to analyze the fate of newly made proteins. Two kinetically distinct pathways of degradation can be discerned using this methodology that is dependent on the presence of an Hsp90 inhibitor or occurs in mutants of the molecular chaperones under study. The first is “zero-point” degradation that occurs either during or immediately after translation. The second is a slower pathway, where the half-life of kinase is approximately 20 min after translation. This work was supported by NIH grants RO1GM70596, U54CA132378 (to A.J.C. ), and NCRR 5 G12-RR03060 (CCNY).